Life at the Top is a 1965 drama film, a production of Romulus Films released by Columbia Pictures. 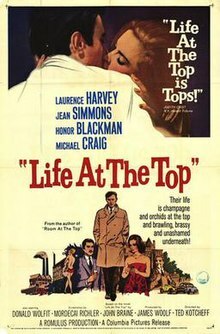 The screenplay was by Mordecai Richler, based on the novel Life at the Top by John Braine, and is a sequel to the film Room at the Top (1959). It was directed by Ted Kotcheff and produced by James Woolf with William Kirby as associate producer. The music score was by Richard Addinsell and the cinematography by Oswald Morris. The film's art director Edward Marshall received a 1966 BAFTA Award nomination. The film stars Laurence Harvey, once again playing Joe Lampton, with Jean Simmons, Honor Blackman and Michael Craig. In Room at the Top, Joe Lampton's escape from his working class background through his seduction of, and marriage to, the daughter of a wealthy mill owner had been portrayed. Ten years on, Joe is living the dream of the successful young executive, complete with luxurious suburban house, white Jaguar, and two young children. However, Joe's life is not the dream it appears to be. Man at the Top, a 1970 TV series featuring Joe Lampton in later life. ^ "Edward Marshall". BAFTA. Retrieved 6 January 2012.